The Federal Reserve Board recently released its April 2014 Senior Loan Officer Opinion Survey on Bank Lending Practices. The survey addresses changes in the standards and terms on, and demand for, bank loans to businesses and households over the past three months. According to the household component of the April survey results, banks eased their lending standards for auto loans and credit cards. At the same time, a net share of bank officers reported having observed rising demand for auto loans and credit cards. 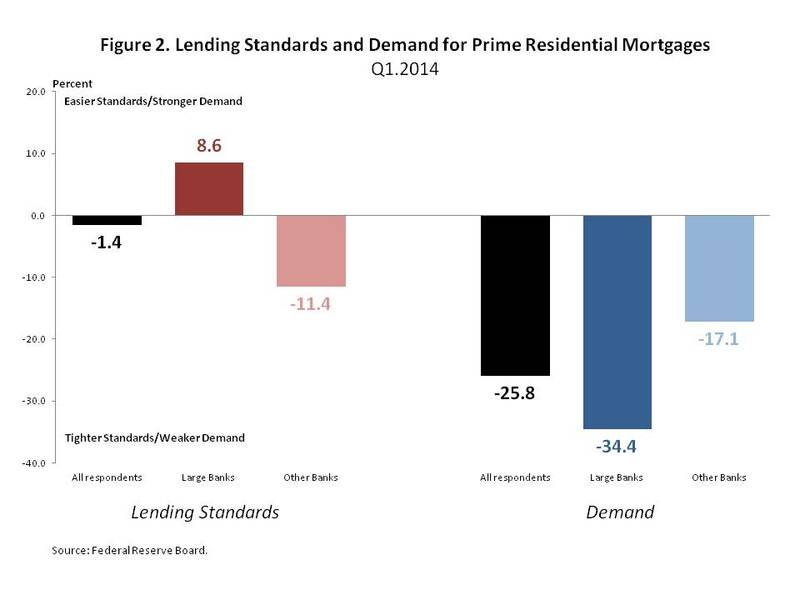 In contrast, a net share of bank officers reported that their bank had tightened lending standards on prime residential mortgages and a net share reported having observed a decline in demand for prime residential mortgages. The figure below illustrates these results. According to the figure, a net percentage of 7.8% of senior bank officers reported that lending standards on auto loans had eased and a net of 10.9% of officers reported having observed a rise in demand for auto loans. Similarly, a net percentage of 9.2% of senior loan officers reported that their bank had eased lending standards on credit cards and a net percentage of 9.8% of officers reported having observed greater demand for credit cards over the first quarter of 2014. 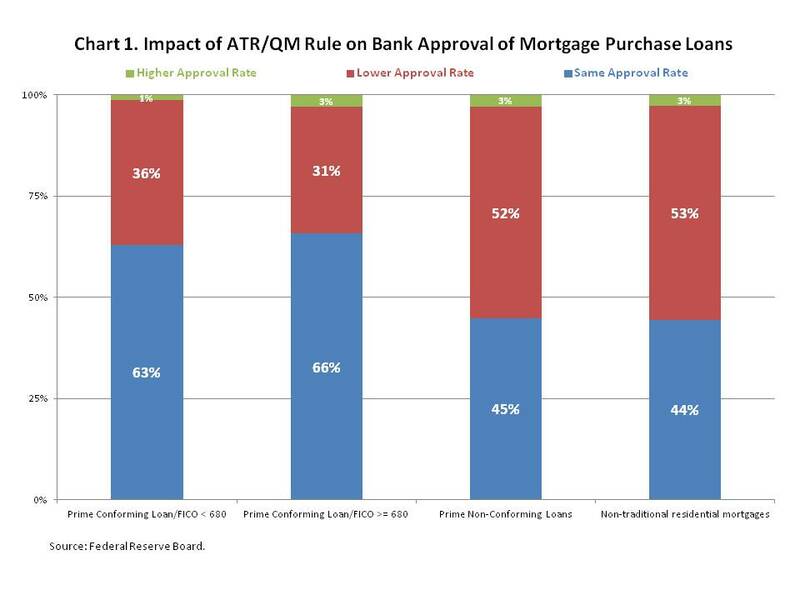 In contrast, a net percentage of 1.4% of senior bank officers reported that their bank had tightened their standards on prime residential mortgages and a net percentage of 25.8% of officers reported having observed a decline in demand for these mortgage products. 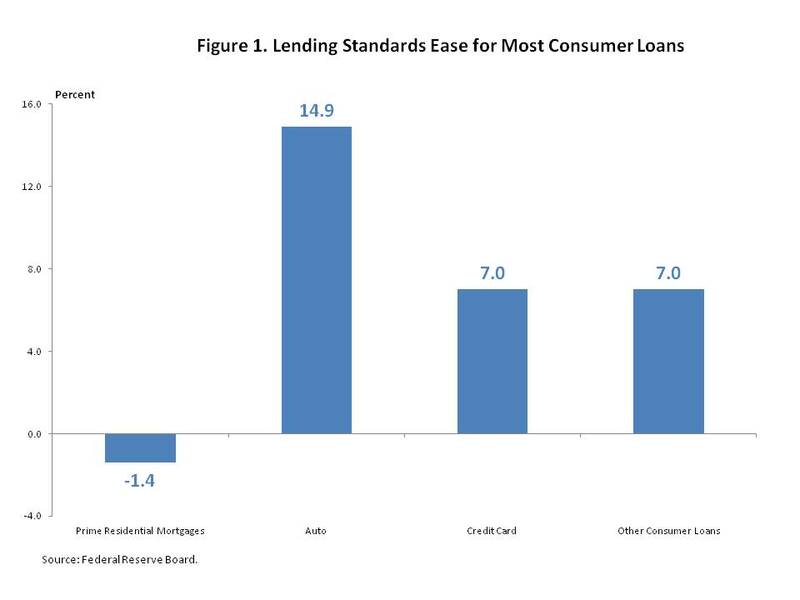 An equal share of bank respondents reported tightening lending standards and easier lending standards as well as stronger demand and weaker demand for other consumer loans. 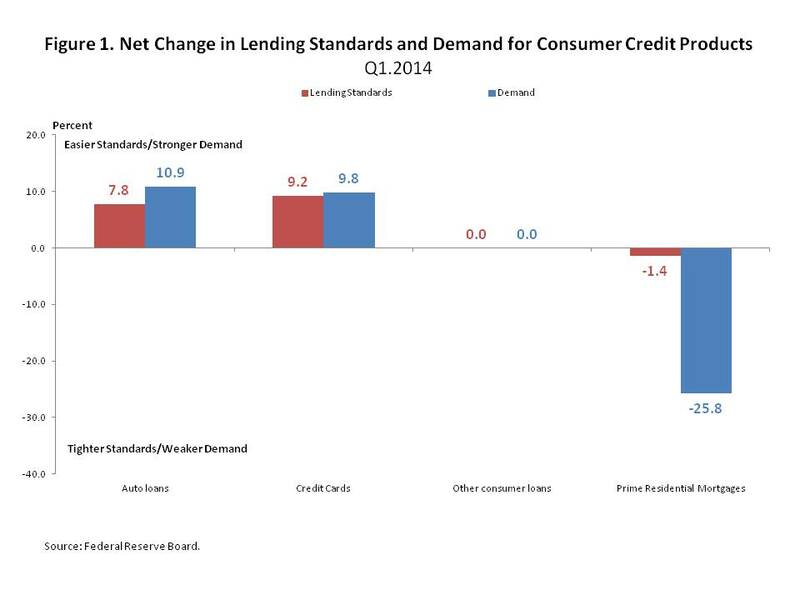 Figure 2 illustrates that the net tightening in lending standards masks variability in its underlying composition. 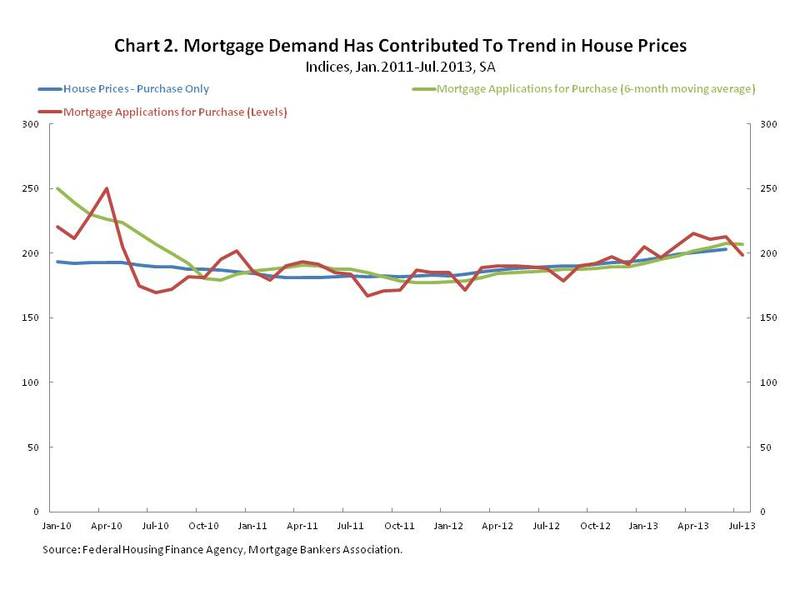 However, the net decline in observed demand for prime residential mortgages was widespread. According to the figure, a net fraction of 8.6% of bank officers at large banks reported that their large bank eased lending standards on residential mortgages. 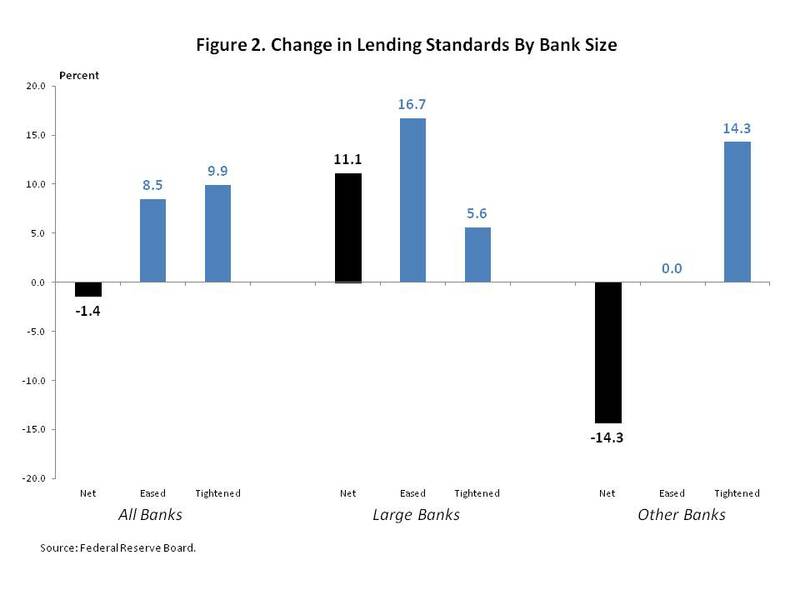 However, the easier lending standards reported by large banks was more than offset by the 11.4% net fraction of bank officers at “other” banks that reported tighter lending standards. According to the survey, large banks refer to large, national banks while other banks encompass large but regional banks. Bank officers at both large banks and other banks reported that demand for prime residential mortgages had declined over the first quarter of 2014. A net fraction of 34.4% of senior bank officers at large banks reported having observed a drop in demand at their large bank and a net fraction of 17.1% of bank officers at other banks observed a drop in demand at their bank. The Federal Reserve Board recently released its survey of senior bank loan officers. The January 2014 Senior Loan Officer Opinion Survey on Bank Lending Practices addressed changes in the standards and terms on, and demand for, bank loans to businesses and households over the final quarter of 2013. 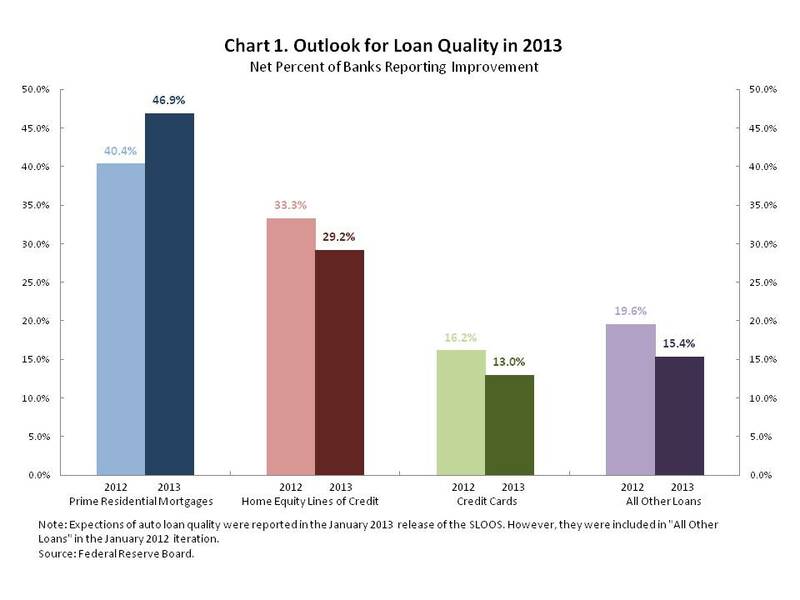 According to the survey results, lending standards eased for most consumer loans. However, lending standards for primary residential mortgages reportedly tightened. As Figure 1 depicts, a net fraction of 14.9% of loan officers reported that auto lending had eased. Meanwhile, a net fraction of 7.0% reported that lending standards on both credit cards and other consumer loan products had also eased over the quarter. In contrast, a net fraction of 1.4% of senior bank officers reported that standards for prime residential mortgages had tightened over the fourth quarter of 2013. The “net fraction” reflects the difference between the shares of senior loan officers reporting that their bank eased standards over the past quarter and answering that their bank tightened its lending standards. A decomposition of the survey results indicates that the tightening of lending standards on prime residential mortgages took place at “other banks”, while lending standards at large banks eased over the quarter. According to the survey, large banks refer to large, national banks while other banks encompass large but regional banks. 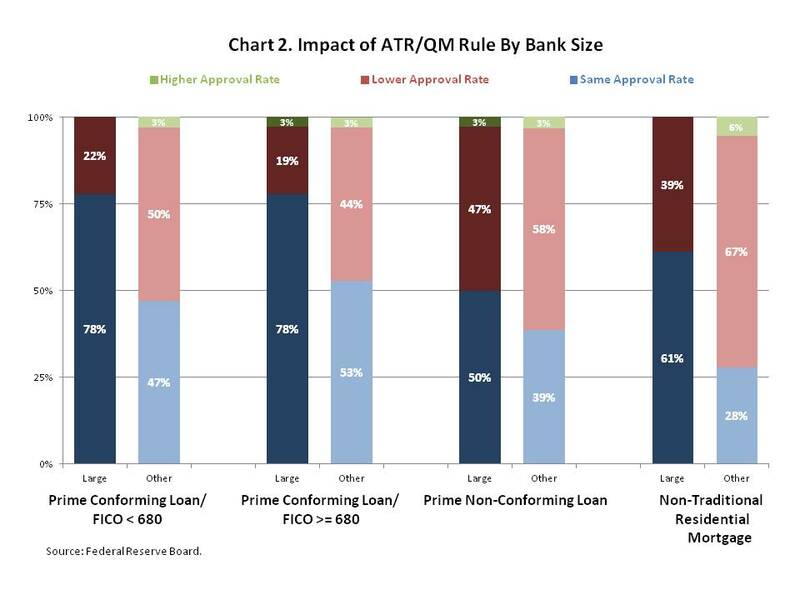 Figure 2 shows that a net fraction of 14.3% of senior loan officers said that lending standards on prime residential mortgages tightened over the previous 3 months, no “other banks” survey respondents reported that their bank’s lending standards eased. In contrast, a net fraction of 11.1% of senior bank officers at large banks stated that lending standards on prime residential mortgages had eased over the past quarter, 16.7% of officers reported that their bank eased its standards while 5.6% of officers said that their bank tightened standards. Data from the Mortgage Bankers Association shows that the share of mortgage loans that are past due declined by 55 basis points (one basis point = one hundredth of a percent) to a seasonally adjusted rate of 6.5% in the third quarter of 2013. This is the lowest rate since the second quarter of 2008. Over the past year, the total share of mortgage loans past due has declined by 0.97 percentage points to a not seasonally adjusted rate of 6.7%. Although the current share of mortgage loans past due has declined from the high it reached in 2009, it remains above the average level over the 20 years between 1980 and 1999. 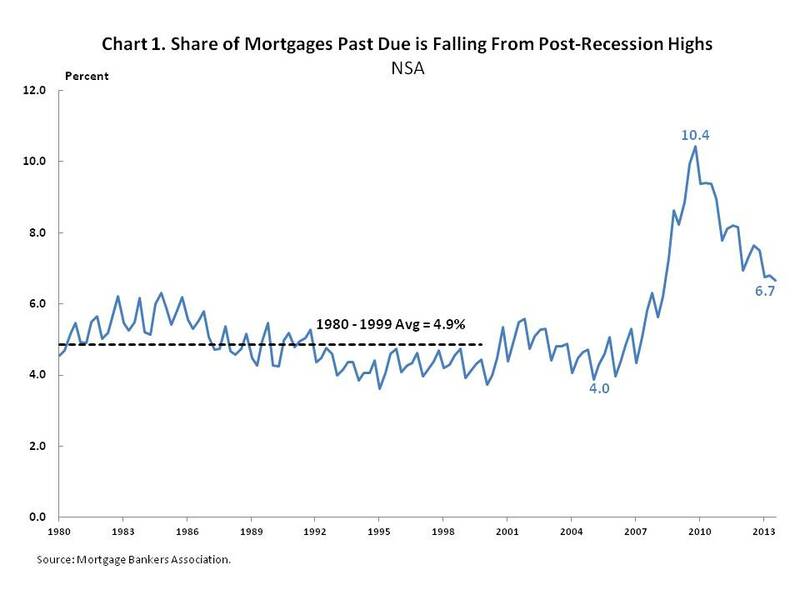 As the chart below illustrates, the share of mortgages past due rose by 6.4 percentage points on a not seasonally adjusted basis to 10.4% in the fourth quarter of 2009. Since then, the share of mortgages past due has abated somewhat, falling by 3.7 percentage points to a not seasonally adjusted rate of 6.7%. However, it remains a 1.8 percentage points above the 1980-1999 average. The recent decline in the share of mortgage loans past due reflects a decrease in the number of mortgages past due. As Chart 2 illustrates, the number of mortgages past due has declined on a 4-quarter basis for 13 consecutive quarters. In the third quarter of 2013, the latest data available, the number of mortgages past due fell by 14.8%. 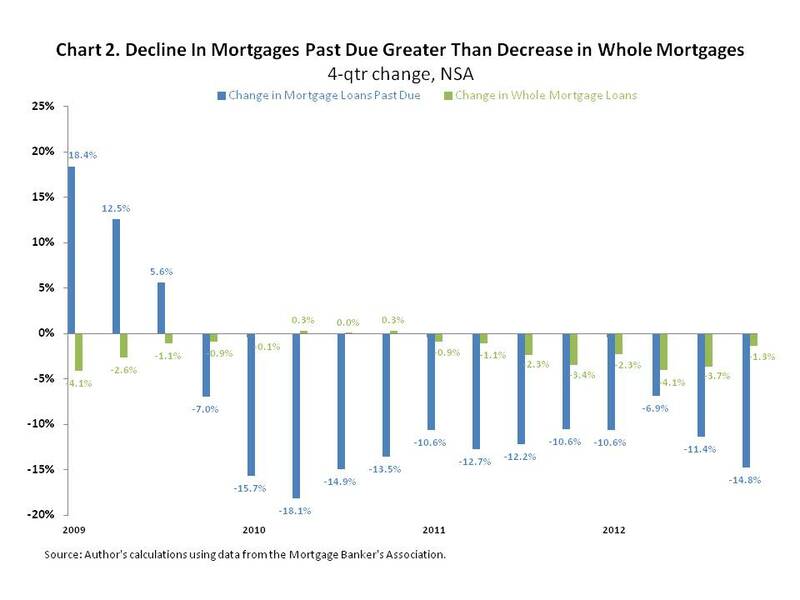 The number of “whole” mortgages, mortgage loans without a late payment, has declined in recent quarters as well. In the third quarter of 2013, the number of whole mortgages fell by 1.3%. The decrease in the third quarter of 2013 marked the eighth consecutive year-over-year decline, following 3 quarters in which the number of whole mortgages did not decline. However, the decrease in the number of whole mortgages has been smaller than the decline in the number of mortgages past due. As a result, the number of mortgages past due as a share of total mortgage loans serviced has fallen. The decline in the share of mortgages past due indicates that the mortgage market is returning to normal. However, this measure of mortgage market health may not provide a full picture of a return to normality in the mortgage market because it masks the decline in mortgage loans serviced. The number of mortgage loans serviced overall, the sum of the number of loans past due and the number of loans that are whole, has fallen on a year-over-year basis for 20 consecutive quarters. 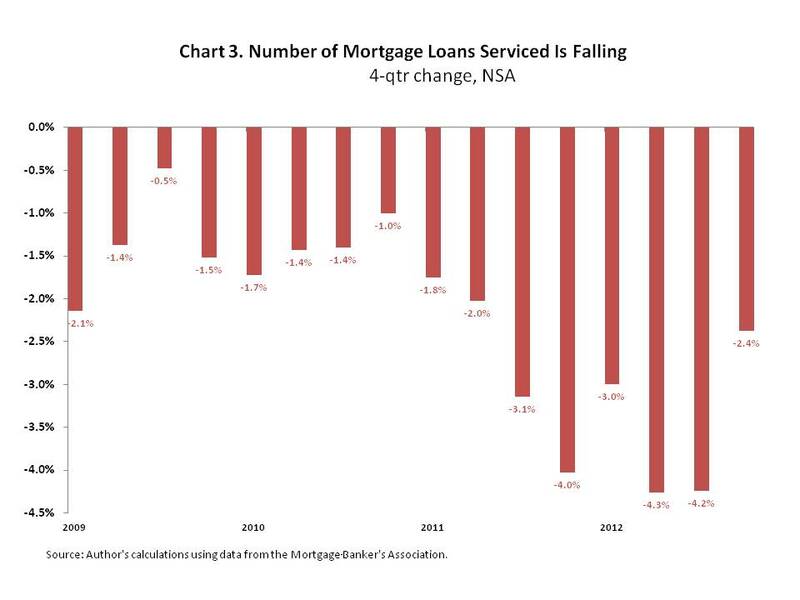 According to Chart 3, the number of mortgage loans serviced fell by 2.4% in the third quarter of 2013. The decline in the total number of mortgage loans indicates that while the growth in the number of mortgage loan defaults is slowing (outflow), fewer new mortgages are being originated to replace those that ultimately default (inflow). The net outflow in the number of mortgage loans serviced may reflect tighter lending standards that make obtaining a mortgage more difficult, but could also reflect the growing prevalence of all-cash deals to finance home purchases. Nationally, house prices continued to rise in the second quarter of 2013. According to the most recent release by the Federal Housing Finance Agency, U.S. house prices rose by 2.1% on a quarter-over-quarter seasonally adjusted basis. This is the eighth consecutive quarterly increase for the House Price Index – Purchase Only. Over the past two years house prices have climbed by 8.1%. 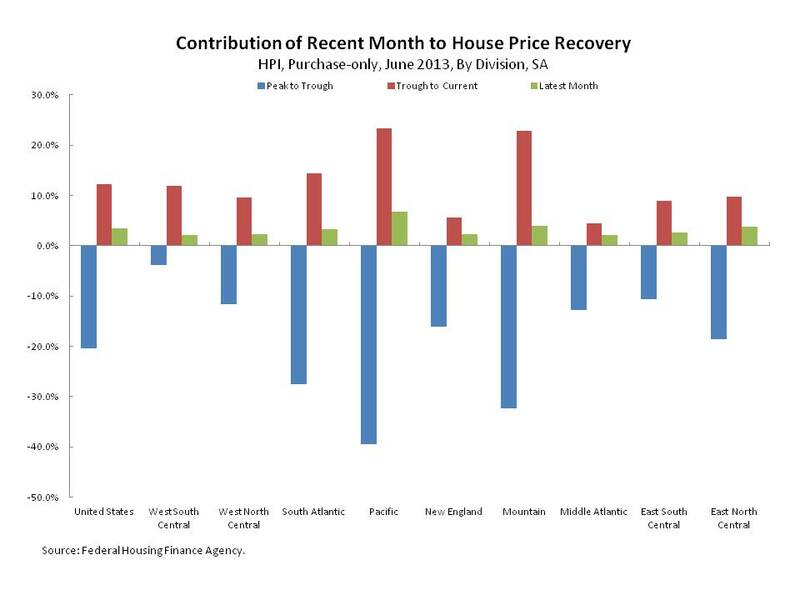 On a month-over-month basis, the June increase in house prices were geographically widespread, increasing in every division of the country. As Chart 1 illustrates, the largest gains took place in the Pacific and Mountain divisions, regions of the country containing states, like Nevada and California, which experienced the largest price declines. Chart 2 updates analysis discussed in an earlier post comparing national house prices, which began a sustained recovery in 2011, with mortgage applications for purchase, a measure of mortgage demand. This relationship is of particular interest because of the recent spike in mortgage rates. Higher mortgage rates could dampen housing demand and restrain house price growth. According to data released by the Mortgage Bankers Association, mortgage applications for home purchase increased by 0.7% over the month of June, but declined by 6.6% over the month of July. Since reaching its most recent peak in April, mortgage applications for purchase have fallen by 7.8%, possibly reflecting the 92 basis point increase in mortgage rates that took place over this same period. As a result of the decline in mortgage applications, the 6-month moving average, which has been rising in tandem with house prices, dipped slightly in July. The 6-month moving average smoothes volatility in the month-to-month data. Holding constant all other influences, the recent decline in mortgage applications that likely stemmed from rising interest rates suggests that house price growth could decelerate in the coming months. However, other dynamics, such as pent-up housing demand and tight housing supply are expected to support house price growth. In addition, the rise of all-cash sales has diminished the role of mortgage applications for purchase as an indicator of housing demand. As a result, rising house prices and the housing recovery will continue. Nevertheless, mortgage applications for purchase, a key method of purchasing a home, will continue to be watched for clues about the direction of house prices. According to the Mortgage Bankers Association, the delinquency rate for mortgage loans on one-to-four family residential properties was 6.8% on a not seasonally adjusted basis in the second quarter of 2013, up slightly (0.06 percentage point) from its level in the first quarter, but 0.6 percentage points lower than its level in the second quarter of 2012. The technical increase in the delinquency rate over the quarter reflected a 29 basis point decline in the share of mortgages 90 or more days past due that was more than offset by a 35 basis point increase in both the proportion of mortgages that were 30-59 days past due, +30 basis points, and 60-89 days past due, +5 basis points. One percentage point equals 100 basis points. Meanwhile, the share of mortgages that were seriously delinquent, mortgages that are 90 or more days overdue plus properties in foreclosure, fell by 51 basis points to 5.9% in the second quarter as the 29 basis point drop in the share of mortgages that were 90 or more days past due was joined by a 22 basis point fall in the share of properties in foreclosure. Since the second quarter of 2012, the share of homes in serious delinquency has fallen by 143 basis points. Despite the recent uptick, the share of mortgages 30-59 days past due is not a strong indicator of serious delinquency. 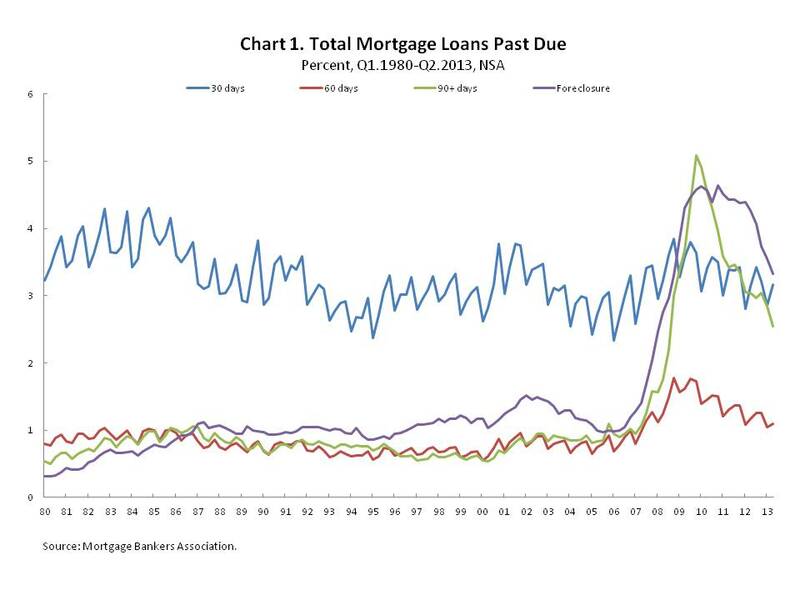 Chart 1 decomposes the share of delinquent mortgages according to their time past due and includes the share of properties going into foreclosure. According to this chart, only a portion of mortgages 30-59 days past due become seriously delinquent. Between the 1980 and 2006, the share of mortgages 30-59 days past due averaged 3.2% while the share of mortgages 60-89 days past due and 90 or more days past due both averaged 0.8% and the share of mortgages in foreclosure averaged 1.0%. A foreclosure rate that is greater than the share of mortgages 60-89 days past due and 90 or more days past due reflects the build-up of properties in this stage due to the length of the foreclosure process. The majority of the mortgages that become 30-59 days past due either remain in this stage of delinquency or cure. In contrast, the share of mortgages 60-89 days past due closely tracks the percentage of mortgages 90 or more days past due and the proportion of mortgages in foreclosure. The similarity in rates over time suggests that that mortgages 60-89 days past due are more likely to become seriously delinquent. As a result, the share of mortgages that are 60-89 days past due is a good indicator of whether a property will become seriously delinquent. Despite the slight quarter-over-quarter rise in the percent of mortgages 60-89 days past due, Chart 1 shows that this measure is trending down, indicating that serious delinquencies should continue to fall. In its January release, which generally covers the fourth quarter of 2012, the Senior Loan Officer Opinion Survey documented answers by senior bank officers on their outlook for loan quality in 2013. On net, which is the difference between the percent of respondents expecting an improvement in loan quality and the share of respondents expecting weaker loan quality, senior bank officers expected the quality of household debt to strengthen in 2013. While improvement is expected across these household debt products, residential mortgages continue to report the greatest net percentage of respondents expecting an improvement in loan quality. Chart 1 illustrates that the net share of respondents expecting the quality of prime residential mortgages to strengthen in 2013 exceeded the share expecting the quality of prime residential mortgages to improve in 2012. At the same time, fewer senior loan officers expect the quality of other household credit products to improve relative to their expectations for their improved credit quality in 2012. On net, the increase in the proportion of respondents expecting the quality of residential mortgages to improve in 2013 was 6.5 percentage points higher than the share expecting an improvement in prime residential mortgage quality in 2012. Conversely, the share of bank officers expecting the quality of home equity lines of credit to improve in 2013 was 4.1 percentage points less than its reported share for 2012. Meanwhile, the portion of respondents expecting the quality of credit cards to improve was lower by 3.2 percentage points. 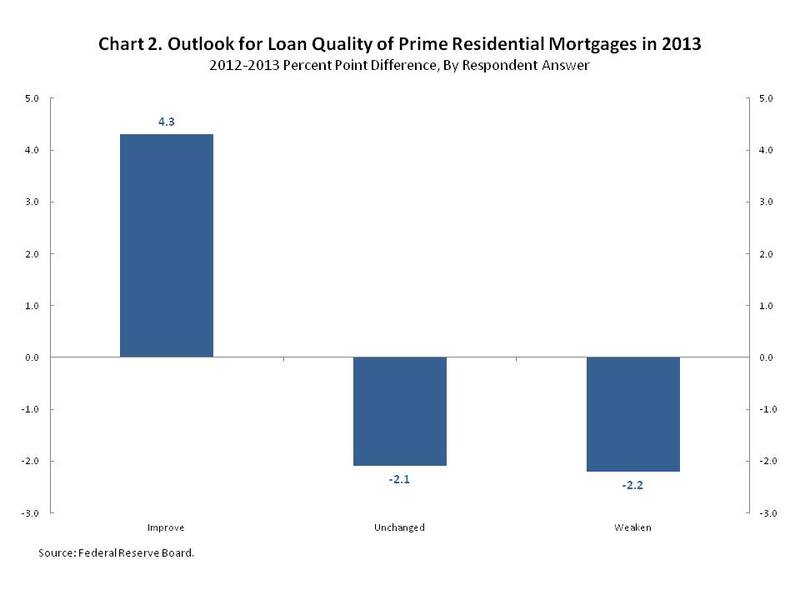 The increase in the expectation that the loan quality of prime residential mortgages will improve reflects a shift away from the expectation that loan quality will weaken or remain unchanged. In a broader context, the increased expectation that loan quality will improve in 2013 follows earlier increases of improvement in other household debt products such as credit cards and provides additional evidence that consumer credit conditions are nearing a recovery. According to Chart 2, the share of respondents expecting the quality of prime residential mortgages to improve in 2013 was 4.3 percentage points higher than in 2012. Conversely, the percentage of respondents expecting the quality to weaken in 2013 was 2.2 points lower than in 2012, and the percentage expecting the quality to remain unchanged in 2013 was 2.1 points lower than in 2012. An expectation of improved loan quality may indicate that lending standards on prime residential mortgages could ease in the near future.